“You MUST go to La Cabrera” was a well repeated recommendation, but for cynical tourists like us, we didn’t fancy the idea of going to an Argentinian restaurant full of tourists…. 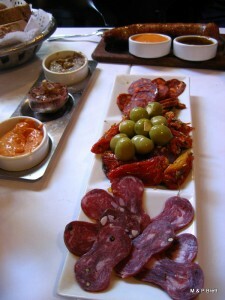 until we were told by a Porteno, a local of Buenos Aires, that we must go there for the most fabulous parilla. We made an attempt one evening but the queue put us off. So, on our last day in Buenos Aires, a Sunday, we headed along around 12.30pm to the second restaurant, just meters away from the original, and managed to get the last available table inside the restaurant, the outdoor tables quickly becoming occupied before 1pm. Inside the decor is charming and themed around food, with old food magazine covers framed and hanging on all the walls, as well as model airplane mobiles hanging from the ceiling. The waiters wear traditional creole caps and are efficient and swift in their service. Bottles of wine are already on the table as the restaurant suggestion to accompany your meal and the board tells of the deals they have on offer. We, foolishly, ordered starters with the Kiwi going for a half portion (you should have seen it, it was MASSIVE, so a full portion must be quite a meal!) chorizo and I ordered the salami selection, which was rather generous and provided three different salamis and olives too. Wondering what on earth we had done, we chomped our way through some of the starter but thought we should hold guard for the main event… and just as well! We ordered the Ojo de bife between the two of us – the beautifully cooked, tender beef would have comfortably fed three and came with 13 different garnishes and accompaniments such as squash puree, creamed corn, potato, aubergine, roasted garlic and other tasty bites and all for the mere price of $57. We chose the Alamos Reserva Malbec to wash this down. I remember a friend entering “Egon Ronay met his Waterloo” in my mother’s Guest Book having dined chez my parents and that quip came to mind now! There is no chasing you off the table once you have finished and we enjoyed the ambience whist finishing off our wine. When the bill comes so does a huge lolly tree and a complimentary glass of bubbly – lovely touch! It is so amazing and wonderful to see a restaurant which is so renowned keep up it’s high standards and it’s resonable prices. Fabulous. For sure, La Cabrera and La Cabrera Norte should be on your “must eat here in BA” list. Enjoy…, man I am so jealous! 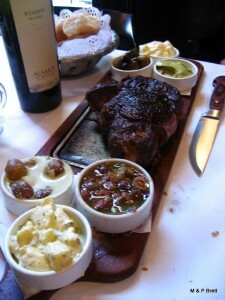 Tagged with Argentina, Buenos Aires, fabulous food, grill, La Cabrera, La Cabrera Norte, Lunch, Palermo, Parilla, Restaurant.